In Art and Design III, I believe that I truly found my art style. My goal in life is to express how I see the world and how we can reserve or improve the situation. I believe that my Afro-futuristic, graffiti style is very explanatory of what I'm doing. This was a very great semester and I can't wait for the next and final class. My only regret is that my art teacher, Ms. Schumann, won't be there to see my creative work in action. lThis portrait was my own combination of modern trends, traditional patterning, and symbolism. My idea was to make my own spin off of traditional couple portraits. Both of my characters have Locs and fade patterning as my hair choice, I felt this made the two look more connected, like how you would see a king and queen in a throne room. I also put Indebele tribe neck rings on the woman so she truly stood out in front of the man. I also made it so the woman looked like she was comforting him, while it’s like the man is afraid of ever losing her. That’s also why I put in the neck rings, so she looked even more special in the portrait. My plan is to make a large scale portrait, with my own style, of either a woman, a man, or maybe a couple, I’ve seen a few from some of my favorite artists and they’re amazing and symbolic. Anyways, I want to add more of a traditional African style, mixed with hip-hop and maybe another style. The background will have more of a scattered graffiti style to it. I plan to have the person either natural colors or more vibrant and/or less naturalThis portrait was my own combination of modern trends, traditional patterning, and symbolism. I used watercolor for everything but the hair patterns, the body paint, and the the outlining of the two. I used white acrylic for the body paint and calligraphy ink for the outlining. I also used stencils for the background, but the watercolors didn’t hold it together giving more of a abstract look that I like. 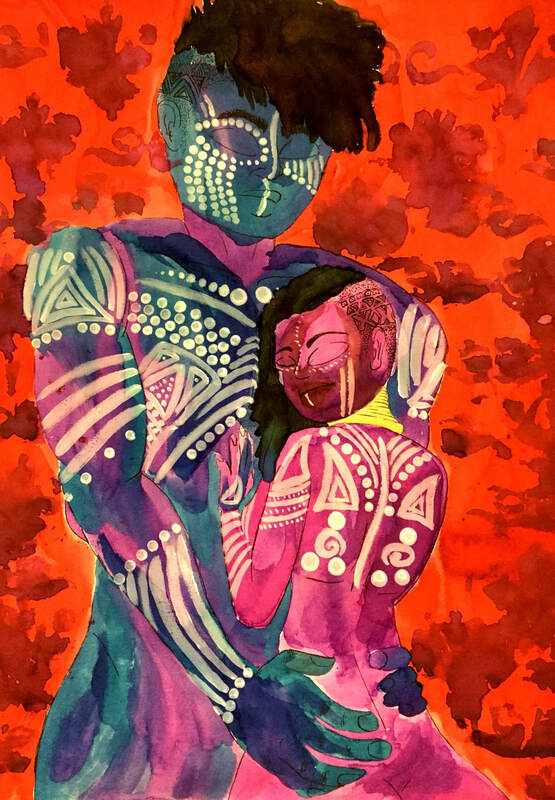 I had a lot of inspiration from pictures of African festivals for the body paint marks and from two of my favorite artists, Justin Copeland and David Choe. ​I love over how this came out, I love how my colors turned out and how the cool colors make them seem more together, especially when I put in purple in with my man. I also like how they jump out against the red background. I was hoping to put clothes on them, but I was crunched for time. Although, I like it even better like this. Truly looking forward to my next project. For my next project, I wanted to create my own african mask. I planned on creating a type of mask that is for decoration, but has the option of being worn. The mask would have a type of seriousness to it, making it look very authoritative. This mask would also be closer to the shape of the face, instead of how traditional masks are wider and/or longer than the original face. 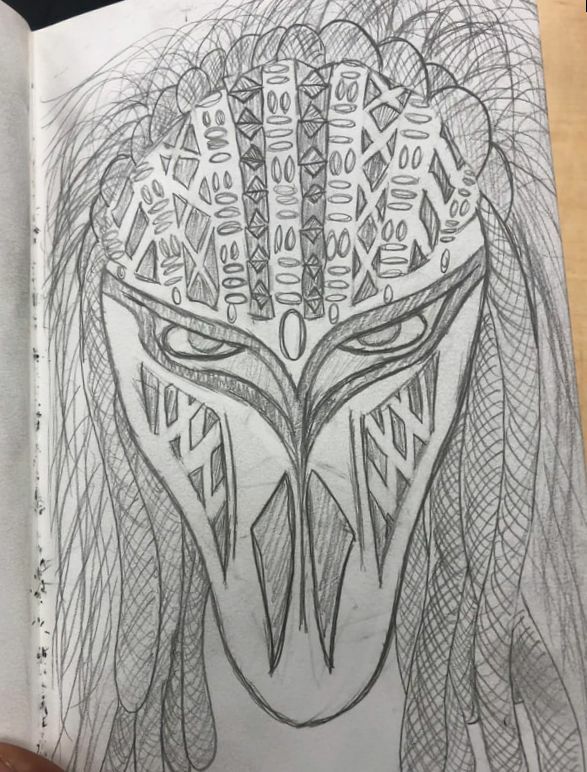 I got this idea from african tribal relics that I saw at the Cleveland Museum of Art, traditional african tribal face paint, and concept ideas from the "Black Panther" movie for the villain, Killmonger's mask. My idea was to create a graffiti Royal series. Basically, this was going to be the first of 2 or 4, having a queen, a king, and maybe a prince and princess depending on the time. ​ All inspired by modern trends, graffiti background styles, and African religious beliefs and/or tradition. For my piece, I wanted her to look like a black version of a Ganesh, which is a Hindu god that has four or more arms. I also wanted every arm pose to work with any of the opposing arms. So like you'll see one arm holding something or doing a pose and the other could be holding their arm out or fixing her hair, whatever. I also made all the tags have something to do with royalty, success, and self acceptance. In graffiti, crowns and heaven halos are used to show status and to pay homage to others. I wanted to use both for this piece to show how big of a deal she truly is. ​ I made the piece with spray paint for the galaxy background, paint markers for the tags (more to come), and acrylic for the queen. After two more weeks, I was finally able to fully finish this piece. In the end, it turned out exactly how I envisioned it, I love how she never blends into the background, which also makes her seem more celestial and royal in comparison. The bubble letters mixed with normal tags gives more of the art I'm used to; kind of a free for all for who can put up their art more, while still respecting the pieces that are truly amazing. I'm a Afrofuturistic graffiti king that loves Black culture including the culture we made and the one we were taken from. 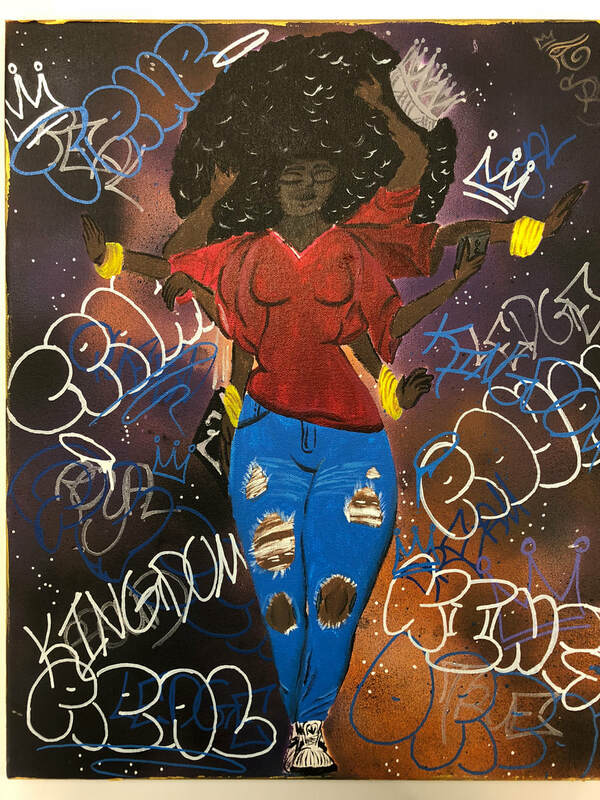 My art is based on African tradition/religion, modern black trends, traditional graffiti with my own little feel to it, present BS happening in the country/world, and my own feelings and beliefs.